This variation on the Italian classic cooks up into a thick, delicious soup that’s perfect for a cold winter night. 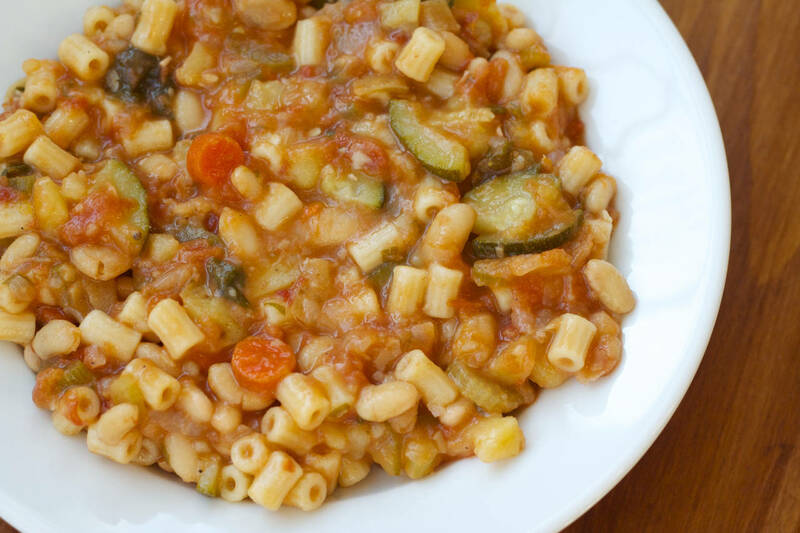 The secret to making great minestrone is to sauté the vegetables over medium heat, adding each one in turn. Starting with the onion builds a robust, flavorful base that provides a solid backbone for the soup. Take your time to ensure that the vegetables are cooked and you’ll reduce your overall cooking time. Rinse beans and place in a small stock pot. Fill with water until beans are submerged by 1 inch. Cook over high heat until boiling. Reduce heat to a simmer and cook for 30 minutes. Remove from heat and let beans sit in water. Just prior to adding them to the soup, drain and rinse them. Sauté onions until soft and transluent, about 5 minutes. Add garlic and sauté until fragrant, about 3 additional minutes. Add carrots and sauté until soft, about 5 additional minutes. Add celery and sauté until soft, about 5 additional minutes. Once vegetables have been sautéd, add chicken stock, tomatoes, white beans, basil, and salt. Stir to combine and bring to a boil over high heat. Once boiling, reduce heat to a simmer at medium-low and let cook, uncovered, until soup has thickened and beans and potatoes are soft, about 2 hours. Add zucchini, swiss chard or kale, and pasta to stock pot. Increase heat to medium-high. Stir to combine and cook until pasta is al dente, about 20 additional minutes. This soup keeps particularly well as the flavors have even more time to combine. Leftovers can be kept in an airtight container in the fridge for up to a week. Recipe and picture taken from Makefoodbetter.com under the Creative Commons License.